I've been silent on this site recently because as of late I don't think anything I say matters. As I've mentioned a few times lately, the blog I respected the most used to be Cilmate Audit. It and its proprietor, Steve McIntyre, had a huge impact on me as I grew up. I discovered McIntyre's first website back when I was in high school, and I followed his the subsequent blog for well over a decade. Following it taught me a great deal, both about technical matters and how the foibles of people shape aspects of our world. I could go on, but I don't want to as I've lost any and all respect for the site as of late. Comey whitewashed the situation, saying that there was no evidence that the Clinton server had been hacked. “No evidence” because all the server logs had been destroyed. Comey ignored the obstruction of justice. According to McIntyre, the head of the investigation into Clinton's use of a private mail server, James Comey, whitewashed the situation by ignoring a felony then misled people by saying there was "no evidence" Clinton's server had been hacked when that was tautological as the evidence which would have shown such was destroyed. This narrative is delusional. I was supposed to be running my next post on correlations today (my goal is to run one such post a week until the series is finished), but recent political developments have left me in a foul mood. If you don't know what I'm referring to, you can see my previous post here. I don't trust myself to put the final touches on a technical post while in a foul mood, so instead, I'd like to discuss a different, but somewhat related, matter. I am interested in paleoclimatology. I am no Steve McIntyre (who runs Climate Audit), as has been pointed out by several of my critics, but I like to think I am reasonably knowledgeable on the field. I certainly know more about it than the average person, and when it comes to fine technical details of individual proxies/reconstructions, I might even be more knowledgeable than a number of "experts." SO today, I'd like to discuss a problem in the field. I don't follow that user, but a person I do follow retweeted that. Its claim was eye-catching so I took a look at the link. I wish I hadn't. I can't deal with this sort of nonsense today. I have long believed people, no matter how great their disagreements, should be able to understand one another. One of my favorite fictional relationships is the one between Professor Xavier and Magneto of the X-Men franchise, where the two men (quite literally) violently disagreed with one another yet held each other in great esteem. In high school, one day a teacher stopped me in the halls and was going to lecture me because he thought he had heard me curse. A classmate of mine was nearby and he immediately stopped and said, "I don't like Brandon at all, but he never curses." That moment has always stuck with me because this classmate didn't like me, yet he was willing to speak up in my defense because he understood me. The reason I bring this up is I published a new (short) eBook just a day or so ago. The point of it is to show how "Skeptics" in the global warming movement don't exhibit actual skepticism. Amongst other things, I thought this eBook might help some people find common ground with one another. Today, I'd like to discuss a reason that might now work. As I mentioned yesterday, this site has reached another year in its short life. I think that's a fitting time to announce my new eBook which has just been published: The Climate Wars: A Disgrace to Skepticism. This book does not attempt to list everything anyone in the Skeptic movement has gotten or done wrong. There are an untold number of errors and misdeeds one could rant about in an attempt to score rhetorical points. That is not the point. The point is the polarization of the global warming debate means none of these problems matter. There are many people in the global warming debate who do honest and good work. They do not matter. As long as people remain silent and allow bad work and unethical behavior to dominate the public representation of their side of a debate, all anyone will have is the same sort of partisan bickering they could find in any political argument. That goes for all sides. Whatever the topic, whatever your beliefs. If you want to be taken seriously or accomplish some task, quit thinking about how “they” are the problem. Focus on what is right and what is wrong. And remember, sometimes you and the things you like might be the ones that are wrong. It's a simple point. If you say it about Warmists, Skeptics will quickly agree, talking at length about how "noble cause corruption" is, well, corrupting climate science. The question is, will any Skeptics acknowledge the same thing is true for them? Experience makes me think they won't. Maybe I'll be surprised. And even if not, maybe some people who aren't as polarized when it comes to global warming will find this eBook worth their time. And as always, if you don't want to spend the $0.99 on this eBook, you're welcome to download a free PDF copy available here. In any event, I think that resolves this issue. There don't seem to be any facts in dispute anymore. I could write a few paragraphs to condemn dishonest and unethical behavior, mock people for their lack of skepticism or any number of other things, but... eh. I'm tired of worrying about that stuff. Instead, I'd like to point something else out: I was right. I'm not saying that to gloat (well, maybe just a little). I'm saying it because this was so incredibly obvious to me. A professional newspaper provided two different versions of the same quotation within one article, and somehow, nobody at the newspaper and nobody promoting the story across the internet noticed. That's just crazy. This, of course, was in reference to the fact the newspaper The Independent ran a story in which a professor named John Wiens was confronted with the hypothetical situation in which he met Donald Trump. When asked what he'd tell Trump in such a situation, The Independent quoted Wiens as saying both, "Kill yourself immediately" and "kill himself immediately." There was more to things as The Independent secretly edited its article some time after I first questioned the quotations, something I find despicable (in response, it has re-edited the piece and hid the fact the changes were initially secret). There may be other aspects as well, but I thought things were finally settled as it seemed there was no longer any dispute over what Wiens had said. The phrase, "Kill yourself immediately" is an internet meme some nnline commenters have co-opted as a joke. Like any meme, it's meaning goes beyond the words themselves. That means the difference between it and"kill himself immediately" is more than grammatical. Even if that weren't true, it is very strange for a newspaper to publish different versions of the same quotation, much less within one article. Following from this, I spent some time talking to people in various locations about the issue. A while after that, the paper (The Independent) which published the two differing quotations (The Independent) edited the article to remove both versions of the quotations. It did this secretly, without any indication. I criticized it for this as secretly changing published material is dishonest and unethical. Some time later, The Independent edited the article again to add a note indicating the original change. While I applaud the effort, secretly editing a piece to hide the fact you secretly edited the piece seems... awkward. Moreover, the note The Independent added did nothing to address the fact it had provided contradictory versions of this quotation. 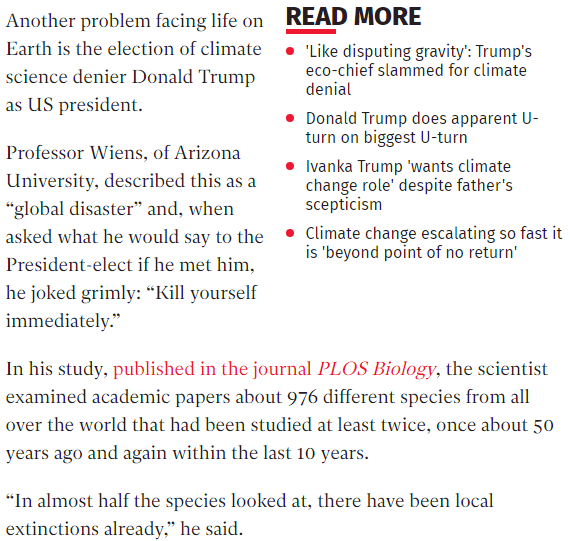 “On Thursday, December 8, I was contacted by Ian Johnston from The Independent, ostensibly to talk about my paper on climate change and extinction that was being published in PLoS Biology (the paper actually received serious reporting by Brandie Wiekle from CBC News and others). “Unfortunately, Mr. Johnston admitted that he had not read my paper, and apparently had little interest in talking about it. It turned out that he only wanted to talk about Donald Trump. I did not. He asked me what I would say to Donald Trump. I said that I really did not think that Donald Trump cared at all what I thought. The man was apparently unhappy with aspects of the story and contacted The Independent about this. That's why it removed the quotations from its articel. That is good to know (and what I suggested had happened), but what I find more interesting is he claims he said "kill himself immediately." That is not the internet meme, "Kill yourself immediately." This would seem to confirm that quotation was in fact fake. Why did The Independent run a fake quote in the body of its text? I don't know. I also don't know why it was so obvious to me the quotation was fishy while "skeptic" sites like Watts Up With That ran it without question. It seems pretty weird. Perhaps some people who ran the fake quotation will correct the record. I doubt it though. It's too good a story to question. Oh, and for documentation purposes, here are archived copies of the article in each of its forms: Original, secretly edited, updated to note the alteration<?a>. Newspaper's Fabricated Quote Suckers "Skeptics"
The internet is full of memes, and if you're new to it, they can seem quite strange. ONE such meme is the intentionally strange, "Kill yourself immediately." The word "immediately" is superfluous as any command given without a timeframe is implicitly meant to be done right away, but that's sort of the point. Memes aren't meant to be serious. They're supposed to be peculiar, odd or otherwise memorable to stick in people's minds. If someone says, "Kill yourself immediately," odds are they are trying to be humorous (albeit in a twisted way). They are not seriously trying to get you to commit suicide. That is why you might see posts like, "God you're an idiot. Kill yourself immediately." It's supposed to be a funny expression of disdain. I never thought it was funny, but hey, bad humor is still humor. Which struck me as odd as I wouldn't expect a biologist to use an internet meme in a discussion of the President Elect. I Looked into it, and it appears the quotation may be fake. If it isn't, a different quotation in the same story is. That's not what stood out to me though. What stood out to me is the very news outlets reporting this story all seemed to use different fake quotes. Other differences amongst the stories are strange as well. It seems in an era where media outlets can practically just copy and paste text from other articles to get clicks, people can't even do that right.